Overview - After a prank goes disastrously wrong, a group of boys are sent to a detention center where they are brutalized; over 10 years later, they get their chance for revenge. The deep wounds of childhood often stay with us long after we have grown into adults, shaping and informing every decision and choice we make, to sometimes disastrous results. Trauma can literally scar us, leaving us broken, incomplete, and so very angry. Once great potential can be dashed by seemingly small actions, and the cruelty of others can burn away all that rests in the heart of man, leaving only an unstoppable hunger for vengeance. Barry Levinson's revenge drama 'Sleepers,' chronicles the story of four children who are forever changed by the horrors they endure in their youth, and examines the thirst for retribution that arises in adulthood. While the film features some strong performances and thematic undertones, the script never succeeds on all levels, sacrificing some much needed character development for the sake of plot. Based on the novel by Lorenzo Carcaterra, 'Sleepers' follows four young kids growing up in Hell's Kitchen during the 1960s. The boys engage in mostly harmless fun, but on one fateful day a prank goes horribly wrong and their lives are forever changed. Forced to serve time in the Wilkinson School for Boys, the group is subjected to terrible physical and emotional abuse by the facility's brutal guards. From here, we flash-forward several years, as the now grown, but still scarred men seize an opportunity to get back at their evil tormentors. The script is divided into two main sections, with the first half focusing on the characters as children and the second half detailing their attempts at justice as adults. A voice over narration from Jason Patric, who plays the grown up "Shakes," serves to tie the narrative together. While the voice-over does provide some necessary information, and can give the proceedings a personal and very literary tone, it can also come across as superfluous and unnecessary, occasionally spoon feeding details and plot developments to the audience. The early portions of the story, showing the boys' care-free childhood in New York, are well done, and the script and direction effectively paint a fully realized atmosphere of youthful abandon and innocence. With that said, outside of "Shakes," and to some extent Michael, the other two child actors don't get as much individual development, making them less distinct as characters. Handled better, is Father Bobby, played by Robert De Niro, in a strong performance, acting as the boys' kindhearted father figure and voice of reason. When the story makes its transition to the harsh walls of the Wilkinson School for Boys, the proceedings takes a very dark and disturbing turn, and thankfully, both the direction and writing do an admirable job of treating the material with sensitivity and artistic merit. At the hands of the school's vicious guards, including a particularly unsavory character played by Kevin Bacon, the children go through almost unspeakable torture. While this subject matter could have come across as exploitative or sensationalized, Levinson showcases great restraint and delicacy. This is especially evident in the most powerful and disturbing sequence in the film, which sees the guards engage in their sick, abusive routine for the first time. Levinson shoots the sequence from a variety of obstructed angles, with the images blocked by various objects and actual chain link gates, almost as if the camera itself can't bear to look at the action. When the horrors get too intense, the camera starts to actually retreat, quickly tracking back, simply unable to focus on the atrocities any longer. While the first half of the movie is fairly strong, there are some shortcomings in the latter sections, which do unfortunately hold back its overall impact. Taking over for the child actors is a great group of performers including Brad Pitt, Jason Patric, Billy Crudup, and Ron Eldard. Though they all do a respectable job, the script itself starts to falter, getting bogged down by an overemphasis on plot to the detriment of character. The revenge plan starts off rather exciting and engaging, but slowly devolves into a standard courtroom drama, and as the players set other complicated events into motion, their involvement in the various machinations becomes fairly removed and impersonal. The script relies too heavily on the emotional investment fostered by its earlier sequences and fails to fully expand upon these bonds later. The internally wounded men end up having little direct connection to their revenge itself, and their distance undercuts the impact of these scenes. One sequence in particular, involving a courtroom confession that is supposed to mark the climax of the script, instead comes across as slightly anticlimactic and doesn't connect as fully as it could have. Thankfully, there are still a few strong, character driven scenes, mostly featuring Minnie Driver, but these sequences still feel a little undercooked. 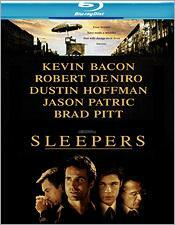 'Sleepers' features some interesting themes and compelling performances. The film's examination of abuse, vengeance, friendship, and the loss of innocence all provide a sometimes thought provoking experience, but the revenge plot itself is much more interesting in set up, than in execution. Ultimately, despite the deep subject matter, the movie doesn't end up having a whole lot to say about what these characters experience. We see them go through the motions, but the final scene lacks a true thematic endgame, simply marking an end to the plot rather than the individual, internal, personal arcs. The concept of vengeance has been examined far better in many other works, but regardless, this is still a well made drama, and the narrative does more right than wrong. This isn't a classic by any means, but it's certainly worth a look. 'Sleepers' is brought to Blu-ray by Warner Bros. on a single BD-50 disc housed in a standard case. After some logos and warnings the disc transitions to a standard menu. The movie is provided with a 1080p/AVC MPEG-4 transfer in the 2.40:1 aspect ratio. This is a decent transfer that unfortunately suffers from a slightly processed appearance. The print is in good shape, with no signs of damage or age. Grain is mostly absent, however, and there is a prevailing, faintly blurry and sometimes waxy quality to the image, which seems to be indicative of DNR. There is also a subtle, vertical banding effect that shows up from time to time, especially in panning motions (the football game scene is a good example). Despite these issues, detail can still be good, but the picture has a predominantly soft look, which seems to be a result of both the digital processing and the original photography itself. Colors are a little subdued, but appear natural and in accordance with the apparent intentions of the filmmaker. Black levels are solid but whites lack intensity leading to no real sense of depth or pop. 'Sleepers' looks serviceable, but it's dragged down by an outdated transfer which employs some unnecessary digital manipulation. The noise reduction isn't as bad as other more egregious offenders, but it is still noticeable and does seem to negatively affect the overall detail of the image. The film is presented in an English DTS-HD Master Audio 5.1 track, a French Dolby Digital 5.1 track, and a Spanish Dolby Digital 2.0 track. Subtitle options include English SDH, French, and Spanish. Though fairly quiet and occasionally front heavy, the film does feature some isolated scenes and sequences that show off pleasing range and immersion. Dialogue is clean and always clear. Directionality is good, and while many scenes tend to be a bit soft and front heavy, there are indeed some standout moments that demonstrate strong surround activity. The early sequences set in 1960s Hell's Kitchen feature some subtle but effective ambient effects, breathing some life into the soundstage. The hot dog stand accident, football game, and several more action related scenes, also carry a more enveloping and aggressive experience. Dynamic range can be strong, with a wide gamut between low and high frequencies, though again, only in isolated instances. Bass activity is a little sparse, but when the movie does get loud and deep, there is some real, shaking thud present. Balance is good, but the relatively quiet nature of the majority of the film can sometimes clash with its remote incidents of powerful sound design. The audio track serves the material well, and though it can be a little uneven, it gets the job done with some occasional impressive bursts of immersion. Original Theatrical Trailer (SD) - The trailer for the movie is included in standard definition and Dolby Digital 2.0 sound. 'Sleepers' is a mostly well crafted and sometimes disturbing drama. The script effectively sets up an emotionally powerful story, but unfortunately, it falters slightly in the follow through. The video quality is serviceable but suffers from some noticeable manipulation, and though a little uneven, the audio holds its own well. With only a trailer, fans will be very disappointed in the complete absence of supplements. Based on the strength of the movie itself, this disc is still worth a look.